The United Nations General Assembly has declared 18 July Mandela Day, to mark the contribution of Nelson Mandela to world freedom. The resolution was introduced by South African Ambassador Baso Sangqu. He described his former president as an icon and a symbol of hope whose life had mirrored United Nations' ideals. Libyan diplomat Dr Ali Abdussalam Treki, the current General Assembly president, said the move showed the body's "attachment to freedom". 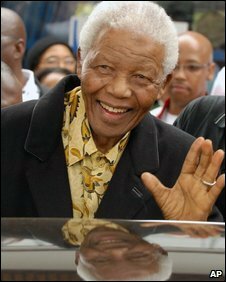 In South Africa, the Nelson Mandela Foundation said it was pleased about the UN's declaration. "It serves as a catalyst for each and every person around the world to realise that they have the ability to change it through action," said Achmat Dangor, the foundation's chief executive . "As Mr Nelson Mandela reminded us 'it is in our hands' to create a better world," he added. The 18 July was chosen because it is Nelson Mandela's birthday. He turned 91 earlier this year. Charities associated with the former South African leader have been campaigning for such a day for some time. They want people to give 67 minutes to a good cause - reflecting the 67 years Mr Mandela has spent as an activist. "These actions can range from a vision for creating peace and reconciliation, to sharing food with a neighbour in need," said Mr Dangor.